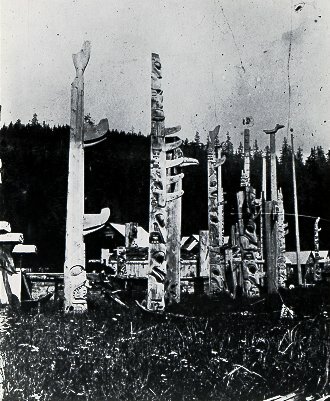 Remarks: Refer to Newcombe 'Miscellaneous Ethnological' file #2 in Provincial Archives for more information on individual poles shown in Dawson photographs. I don't think this is Dawson ,however I will be able to tell when the shipment of Dawson photos taken on the Charlottes comes from the NMC. D.S. March 19/76, SEE NMC.254 and NMC255 -in other museums oversize binder. This photo appears to have been taken after 1878.